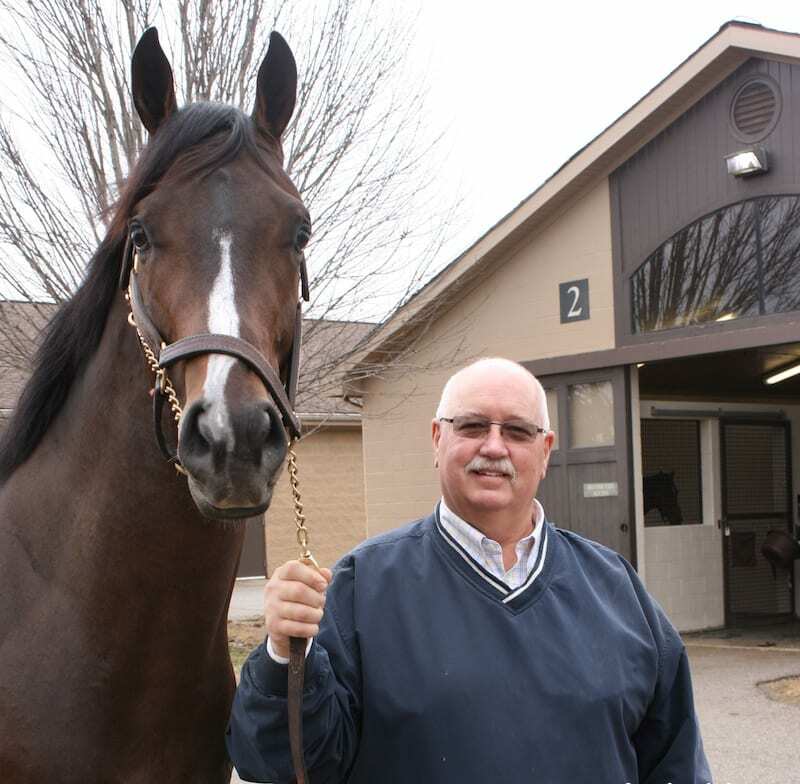 Few equine veterinarians have the clout of Dr. Larry Bramlage. In the Thoroughbred world, he is the expert eye trainers trust to get to the bottom of a horse's difficult lameness. When he sits on a panel at a veterinary conference, the crowds frequently overflow. In his time on the NBC Triple Crown broadcasts, the public came to know him as the translator of medical jargon and the wizard who can restore injured horses. After 40 years in the business, his name has accumulated a type of very specific celebrity inside and outside the veterinary world. So how does a farm boy from Frankfort, Kan., (population 726) become The Larry Bramlage? He will tell you it's mostly down to luck. “Did you ever read that book, 'Outliers' by Malcolm Gladwell?” Bramlage asked one winter afternoon in the administration building at Rood and Riddle Equine Hospital in Lexington, Ky. “The premise of the book is that people aren't born with exceptional ability. The ability to succeed in your profession has to do with your ability to work hard and take advantage of a special set of circumstances. Bramlage was a junior in high school when a guidance counselor asked him what he wanted to do with his life. Bramlage replied that he didn't know, so the counselor gave him the weekend to think about it. Bramlage was out helping his father with the family's cattle farm that weekend when Dr. Keith Beeman came by to do some work on the cows. The next week, Bramlage returned to school and told the counselor he wanted to be a vet. At that time, Bramlage's exposure to horses had been the stock horses the family kept to work cattle. He assumed he would complete his veterinary degree and work primarily on livestock, spending long days on farms like his father's. He had never even been to a racetrack until a field trip his junior year of veterinary school at Kansas State University — the class went to Fonner Park to observe morning workouts. Bramlage said even back in the early 1970s, Fonner Park was a small-time track, while Nebraska's Ak-Sar-Ben was still running at full steam. It was a completely new world, and one he immediately knew he wanted to be part of. Bramlage did an internship at Colorado State University after graduating Kansas State in 1975, then took a residency at The Ohio State University. Bramlage knew early on he wanted to specialize in equine orthopedics. The science “just made sense to him” and the puzzles horses presented him with were fascinating. At the time he completed post-graduate schooling, equine orthopedic medicine was changing. 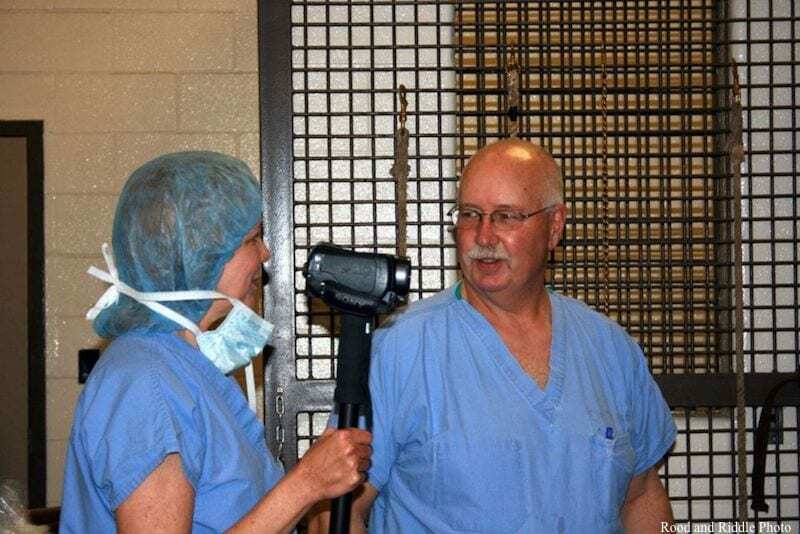 Arthroscopes were becoming an important tool for human and animal physicians, though in those days, there was no camera on the end of them; instead, the veterinarian had to position the tool inside the joint and look through the end to see what he was doing during surgery. People were also perfecting anesthesia and recovery techniques for horses undergoing orthopedic surgery, and the human and veterinary medical communities were beginning to learn more about internal fixation, the process of inserting screws and plates into bones to help them heal. The techniques had been used in Europe for some time but were still new in the States. Bramlage was asked to help teach the first internal fixation course at Ohio State and has remained chair or co-chair of the course ever since, helping guide its content. Nearly everyone practicing orthopedic surgery on horses in the United States has taken the course (it's required for residents at veterinary colleges now), which means just about every surgeon putting a plate in a horse's leg to heal a fracture is carrying a little bit of Bramlage's wisdom and experience with them into the operating room. During his residency, Bramlage also became interested in fetlock injuries, inspired in part by Ruffian's tragic death. By the late 1970s, he developed the fetlock arthrodesis, which fuses the ankle using compression plates, stabilizing it and allowing for weight-bearing much sooner. The method, now widely adopted, first gained attention when he used it on Noble Dancer and Personal Ensign. There are often three prescribed applications for a veterinary degree: practice, research, and teaching. Many veterinarians choose one path to focus on, but Bramlage has always found himself divided among the three. But splitting one's time between three endeavors that typically comprise full-time jobs on their own can cause problems. By the late 1980s, Bramlage had a leading role in academics and practice at Ohio State, he had a small private practice with Dr. Rick Mather, and he was consulting on orthopedic cases in Kentucky one day a week. He was basically working around the clock. “My wife said, 'Your kids aren't going to know you.' I've always been sort of stuck between clinical practice and teaching and education. I had to choose one or the other,” said Bramlage. Rood and Riddle had courted him once before, but the hospital needed a general surgeon and Bramlage didn't want to open back up to non-orthopedic cases. In 1989, they struck a deal and the family moved to Kentucky. At the time, the clinic was two barns and a small surgery/administration building. The partners added a barn a year for five years, and the campus has continued growing ever since. About 15 years ago, Bramlage developed the client base to restrict his practice to Thoroughbreds only. He hasn't had an open lameness appointment in years. For the last two years, he has seen 900 racehorses for lameness exams each year – a feat he credits in part to his supporting technicians, Sheri Miller, Amber Brandt, and administrative assistant Jen Wolery. Although there's no arguing his eye is sharp for lameness exams, Bramlage does not look at a horse on the jog and see its areas of soreness light up by magic. And by the time their discomfort is visible to the human eye, it's usually multifaceted. Bramlage said for him, lameness exams are methodical. He approaches the most obvious lameness first, and “blocks it out” before locating the next one. This means he applies short-acting nerve blocks to strategic spots on the leg (typically working from the bottom up). Each spot feeds nerves in identified, isolated parts of the leg below it. When a clinician is searching for the source of a problem, they apply blocks until the horse shows resolution – then they know the injury is somewhere in the region impacted by the most recent block. Bramlage said he typically blocks out a problem in one leg and sees another (usually pre-existing problem) emerge in another leg. When all issues have blocked out and the horse is sound, he has a map to use for advanced imaging like radiograph, ultrasound, or MRI. Though Bramlage is quick to attribute his success to luck, hard work, and his top-notch support staff, longtime colleague and close friend Dr. Bob Copelan believes he's being too modest. Copelan first encountered Bramlage when the latter was completing his residency at Ohio State. Copelan referred a horse to the veterinary school's hospital and called to check in on how it was progressing. Bramlage was the one who answered the phone. Copelan points out that while Bramlage did come along at a pivotal time for orthopedic surgeons, his success isn't happenstance – it seemed to Copelan like part of a focused plan. Although he traded his busy schedule in Ohio for a single, focused job in Kentucky, Bramlage hasn't exactly been putting his feet up over the past 30 years. He has served as television consultant at the Triple Crown and Breeders' Cup, past president of AAEP, past president of American College of Veterinary Surgeons, a consulting surgeon for Lloyds of London Insurance. He has been named in both Who's Who in Science and Who's Who In American Colleges and Universities. He has received the Joe Palmer Award from the National Association of Turf Writers and Broadcasters, the AAEP distinguished service award, and the Jockey Club's Gold Medal for Contributions to Thoroughbred Racing. He continues to author papers in peer-reviewed journals along with fellow veterinarians at the clinic. Recently, he has developed a renewed interest in the Grayson-Jockey Club Research Foundation, where he helped to engineer the research proposal screening process still in effect today and where he now reads proposals seeking funding. The extra reading keeps him sharp, he says, as he often has to do some background research to keep current with the science. All of this makes for long, mentally exhausting days. So, on evenings and weekends, Bramlage takes a few hours away to give himself a break. He and wife Marilyn have a 100-acre farm outside Lexington where they keep 45 cows. Feeding the cows after a day of surgeries helps renew his focus for an evening reading academic papers, and he welcomes the maintenance that comes with the farm. At 67, Bramlage is aware many people (non-horsey, non-veterinary people) would be thinking about hanging it up. Under his contract as a Rood and Riddle partner, he'll have to sell his shares at age 70, but that stipulation doesn't require him to stop practicing. As far as he's concerned, veterinarians are much like horse trainers – their work is their life, and 'retirement' sounds too quiet. He understands that drive — the horses keep him sharp, and even he isn't finished learning from them yet. This entry was posted in NL Article, Ray's Paddock and tagged aaep, Dr. Larry Bramlage, dr. robert copelan, equine orthopedics, equine surgeons, equine veterinarians, Grayson-Jockey Club Foundation, Rood and Riddle Equine Hospital by Natalie Voss. Bookmark the permalink.